Our courts typically consist of a 2″-3″ section of asphalt over an engineered & laser installed base section, asphalt courts are softer on the knees & provide an increased number of cushioned surfacing options. Despite it’s reputation as a school-yard type product, today’s completed asphalt courts are visually indistinguishable from their hard court counterparts. Typically constructed similar to standard hard courts, most backyard courts are only limited by your space & imagination. 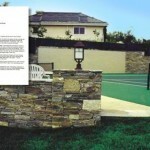 Custom graphics & colors are no problem, & cushioned surfaces are also available. We rep & install First Team units, one of the most respected manufacturers in the industry. EPDM rubber surfacing is available in a wide vary of colors, & can be installed with custom graphics & designs. EPDM rubber is the top coating you see at most public parks these days. Rubber filled acrylics & cushioned mat overlays are also available in all of the standard resurfacing colors. We rep and install a wide variety of manufacturers & equipment including First Team Basketball Equipment, Douglas Tennis & Maintenance Equipment, Lee Clay Court Tennis & Maintenance Equipment, and many others. If we don’t stock it, we can get it. Also called Fast Dry courts, Har-Tru & clay courts offer a softer, slower play option to the standard hard courts so prevalent in southern California. Our courts typically consist of a 1″ laser installed clay section over a engineered base section, Har-Tru (green clay) & standard red clay courts require moisture monitoring & are hydrated either by a pop-up irrigation system or by a subsurface reservoir, referred to as a Hydrocourt. Hydrocourts are the preferred option in southern California where water is at a premium & Lee is the premier manufacturer of clay court surfacing material. 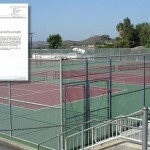 We offer installation of new lighting systems on new & existing courts, and renovation of existing lighting systems. 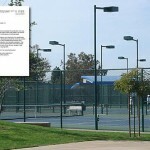 1000-watt metal halide fixtures are the industry standard and are usually eight light systems on private & club courts. Concrete, asphalt, or cushioned mat overlays are available for existing problem courts, and are often the only solution for a badly damaged surface. Like the basketball courts, endless options are possible. Typically courts combine many different sports including basketball, paddle tennis, volleyball, soccer, & even batting cages. 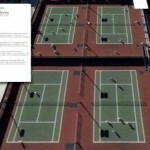 Our courts typically consist of a 5″ thick slab with 8″ thickened edges, reinforced with ½″ steel cables over an engineered & laser installed base section. The cables are installed at midpoint in the slab & are then tensioned after concrete placement. Because tennis courts aren’t constructed with expansion joints at 10′-15′ on center as in other concrete construction, this is the preferred method of tennis court construction. We offer all phases of resurfacing & refurbishing, from just a refreshing of your court with a single topcoat to a complete stripping & refurbishing of your deteriorated court including fencing & lighting. We can also add additional sports to your existing court, or completely change the court to a different type. We use Plexipave & Laykold acrylics, which are available in a wide variety of colors. Our artificial turf overlays are specifically manufactured for tennis or soccer & are typically installed over a new or existing concrete slab. White or green sand is then groomed into the surface that results in a softer, slower play similar to clay courts, but without all of the maintenance. Perfect for renovation over cracked, deteriorated slabs & on rooftop courts. Our courts typically consist of a highly reinforced, 6″ thick slab utilizing a special concrete mix design, over an engineered base section. Integral, dust-on, & acid stain color options are endless. Painted or sandblasted/etched lines & numbers are available, followed by professional sealing & waxing. Our courts typically consist of a typically a 4″ thick slab with 6″ thickened edges, reinforced with 3/8″ rebar over an engineered & laser installed base section. Usually several thousand dollars less than post tension construction, this is the method of tennis court construction used when budget restraints are an issue, or when post tensioning isn’t practical due to surrounding walls or other obstacles. A 5″ thick slab reinforced with ½″ rebar is also an option. 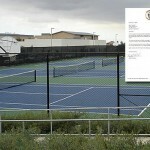 In addition to hard courts, grass & sand courts are also available. We also manufacture & install “beach-type” volleyball posts & equipment. Green or black open mesh “Leno” grade windscreen is the most commonly used on courts today. In addition we offer closed mesh & solid vinyl, as well as many other color choices including brown, blue, and gray. Fire retardant material is also available.